Castaways Holiday Park01692 650436work Holiday ParkFun times are here at Castaways! 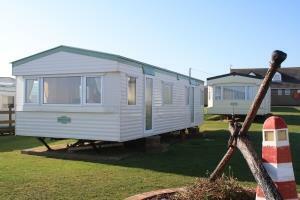 For one of the best value holidays on the glorious North Norfolk Coast, welcome to Castaways Holiday Park. We are a small, family run business situated in the quiet and peaceful village of Bacton-on-Sea, approximately 10 miles from Cromer and 21 miles from Great Yarmouth and Norwich. There are stunning sea views from most of our accommodation (inc pine lodges, apartments and static caravans) with steps from Castaways onto a beautiful sandy beach. Facilities inc shop/reception, playground, launderette, amusement arcade and clubhouse with entertainment at peak times. Fun times are here at Castaways! Open all year. Pets very welcome.